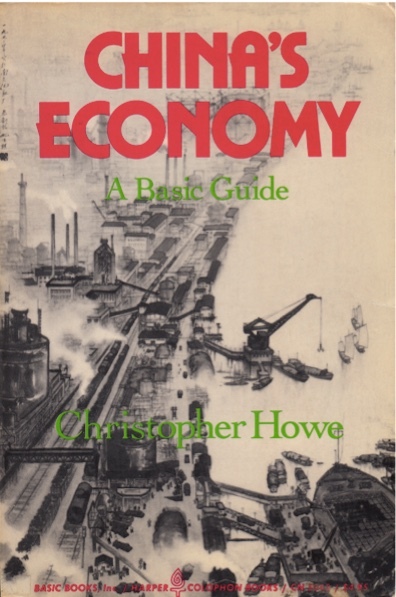 Browsing at the Beijing Book Fair this past weekend, I stumbled across an old book (in English) called China’s Economy: A Basic Guide, by one Christopher Howe, mixed in among the usual mess of the collected works of Mao and art auction catalogs. Of course I snapped it up; not because it is some kind of lost classic, but because it presents a view of China circa 1976, before the reform era and big changes in the Chinese economy that ensued. In these days when China’s massive role in the global economy is a fact of life, it’s hard to look at its history without having your view colored by the knowledge of what happened after 1978. I think it’s quite informative to see what China looked like to people who did not already know that it was going to turn into a world-shaking economic power. The Chinese frequently refer to the fact that trading partners from sixty countries use the renminbi as the unit of settlement. In general, this reflects the wishes of the Chinese rather than of their trading partners; indeed, insistence that contracts are denominated in the renminbi has at times been a serious obstacle to trade. In 1958 a further policy was introduced, one that has persisted to this day. This is the policy of developing “small and medium” cities. In conversation, Chinese officials give varying definitions of these city types, but an authoritative article published in 1958 described the policy in the following terms. “Small cities” have populations of up to 300,000, and are to be “generally developed”; “medium cities” are those with populations of 400,000 to 700,000, and are to have “limited development.” Anything bigger is a “large city,” and is to be “generally restricted.” Special emphasis is put on control of cities with populations of a million or more. With some updates to the numbers for the size of cities, this passage would serve nearly word-for-word as a summary of the current government’s urbanization policy. It is interesting that the focus on “small and medium” cities, which I think is misguided, has such a long history. It’s not clear why this policy has remained so attractive over time–Howe notes that the justifications for the policy kept changing–but perhaps inertia explains some of its persistence. I suspect further reading will reveal even more parallels. ← Previous Post Has China’s pollution held back life expectancy?